It was an eventful day. We got up at 4:30 this morning to go to the hospital. Janet's surgery wasn't scheduled until 7:30, but there's always a lot of paperwork when you check in. I'm always amazed at how empty the roads are at this time of day. If only it were this way all the time. I stayed until the anesthesiologist came and took Janet to the OR and then I went home and fed Dash his breakfast and took him on a walk. By the time I finished my own breakfast and did the dishes I got a call saying that Janet was in recovery. She didn't have to stay in the hospital overnight this time, so I drove back down to the hospital to take her home. By the time I arrived, the eclipse had already started. As I entered the building, I passed a doctor looking at the eclipse through a sheet of x-ray film. Some nearby nurses asked him if the x-ray film was safe. "I don't know," said the doctor. The nurses took turns looking through the film anyway, probably thinking that if this makeshift filter was good enough for a doctor, it was good enough for them. Since these people didn't appear to go blind, I asked if I could take a look too. I'll have to say that x-ray film makes a darn good solar filter. By the time that Janet and I arrived back home again, the eclipse was near it's maximum. 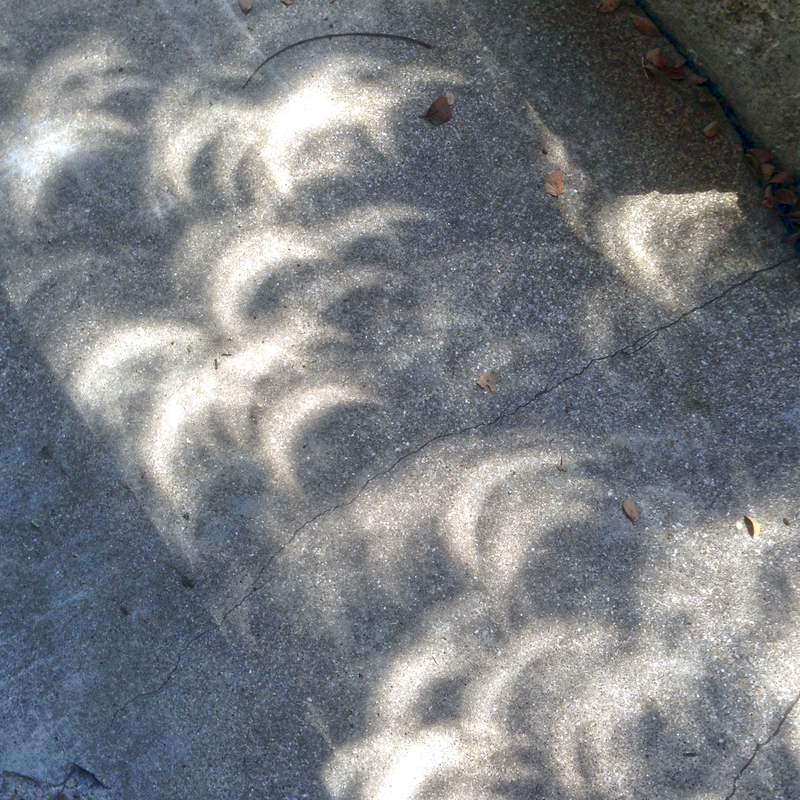 The sky was noticeably darker and the light filtering through the trees in front of our house made lots of little crescent shaped images on the sidewalk. Janet wanted to go to sleep, so as soon as she was settled in, I went down the street to watch the remainder of the eclipse through a neighbor's telescope. You could see sunspots through the telescope and by using them as a reference point, it was easy to see how fast the moon was crossing in front of the sun. The edge of the moon wasn't completely round either. You could clearly see the outline of mountains and valleys silhouetted against the sun. The guy with the telescope had a good supply of eclipse glasses, so everybody got a good view. It seemed like half the neighborhood showed up for this impromptu event. I hadn't seen some of these people for quite a while and some of them didn't even know that Dot had passed away. It was nice to see a group of people where everyone was happy and nobody was protesting anything. I think Janet's surgery went really well. She will be home for two weeks, but that is much better than the six weeks it took to recover after the first surgery. This time there are no tubes that need to be drained every four hours. There are still bandages that need to be changed and procedures that need to be followed to avoid infections, but everyone is anticipating that her recovery will go smoothly. I need to take Dash to the vet early tomorrow morning for his Phenobarbital level test. I was going to do this on Wednesday, but there are thunderstorms in the forecast. I think it will be easier tomorrow. I need to take Janet back to see her surgeon on Wednesday as well. If the weather is bad, we'll just take Dash with us. I hate to leave Dash alone during a storm. I've learned from experience that he can get into some serious trouble if he panics. It would have been nice to see the sun's corona today, but I definitely did get to experience the eclipse. I'm glad that Janet's long and difficult journey is coming to a close. Hopefully, in a month or two this summer of surgery will just be a memory. John Sealander is a writer/photographer who loves Dalmatians. He received a Bachelor of Architecture and a BA in Art from The University of Arkansas. His rich and diverse experience includes working as an architectural designer for Fred Bassetti in Seattle, producing documentary films for PBS, shooting commercial photography for True Redd’s “Great Shooting Gallery” in Dallas and teaching writing courses at SMU’s Academy of Visual Communication. For over 35 years, John has developed memorable and award winning ads and images for some of the world’s leading ad agencies and most popular brands. In 1990 he started Sealander & Company, the Dallas, Texas based production company and multi-media agency where he continues to develop his ideas today. 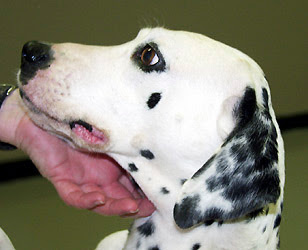 Our "Dalmatian of the Day" feature showcases one of the many great dogs rescued by Dalmatian Rescue of North Texas. 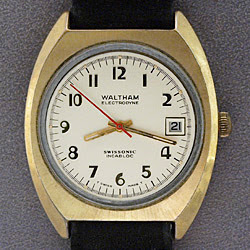 The "Watch of the Day" is just the watch that John happens to be wearing today. We'd love for you to become a blog follower.